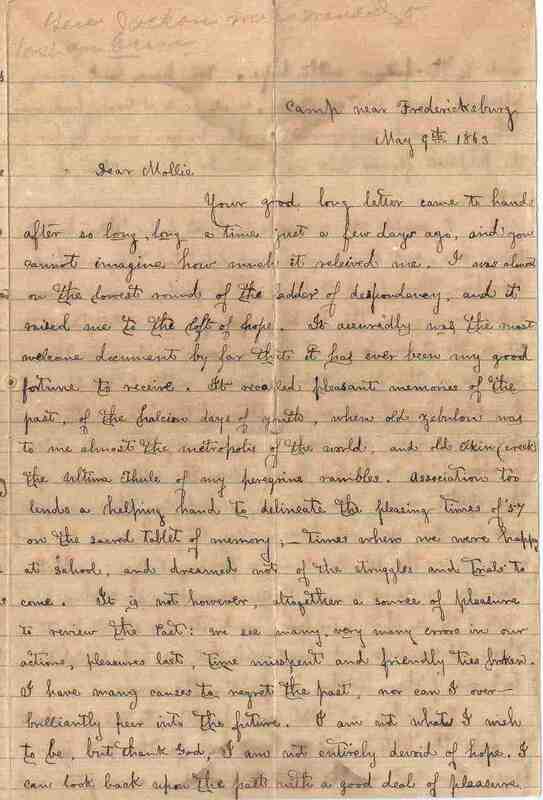 Item description: Letter, dated 9 May 1863, from Harrison Wells to his sweetheart Mollie Long. 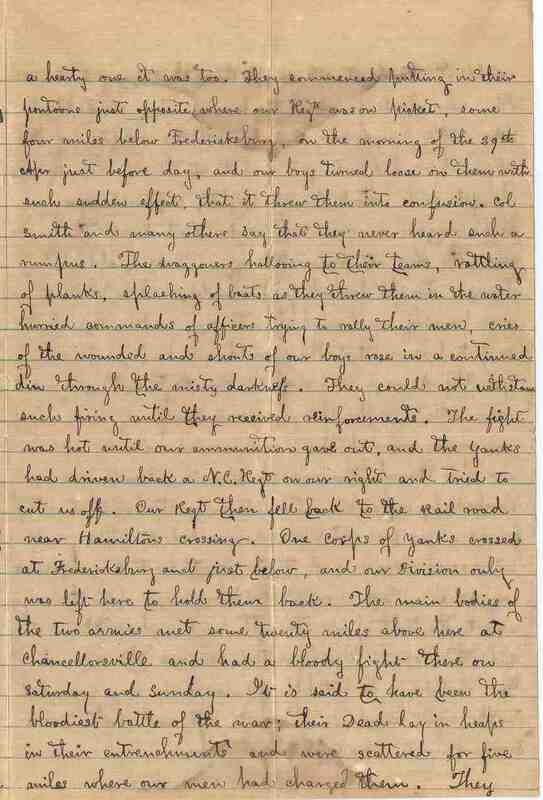 Wells, a sergeant in the 13th Georgia Infantry Regiment, describes his homesickness and his experiences at the Battle of Chancellorsville. He notes the injury of Stonewall Jackson during the battle and his impression of the Confederate victory. 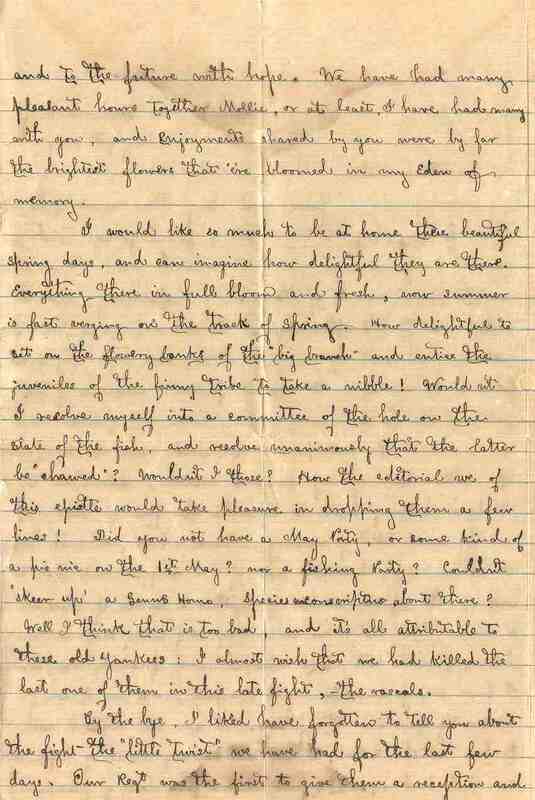 From folder 2 of the Harrison Wells Papers, Southern Historical Collection, Wilson Library, University of North Carolina at Chapel Hill. Your good long letter came to hand after so long, long a time just a few days ago, and you cannot imagine how much it relieved me. I was almost in the lowest round of the ladder of despondency, and it raised me to the loft of hope. So assuredly was the most welcome document by far that it had ever been my good fortune to receive. It recalled pleasant memories of the past, of the halcion days of youth, when old Zebulon was to me almost the metropolis of the world, and old Elkin (creek) the ultima Thule of my peregrine rambles. Association too lends a helping hand to delineate the pleasing times of joy on the sacred tablet of memory; times when we were happy at school, and dreamed not of the struggles of trials to come. It is not, however, altogether a source of pleasure to review the past: we see many, very many errors in our actions, pleasures lost, time misspent and friendly ties broken. I have many causes to regret the past, nor can I over-brilliantly peer into the future. I am not what I wish to be, but thank God, I am not entirely devoid of hope. I can look back upon the past with a good deal of pleasure and to the future with hope. We have had many pleasant hours together Mollie, or at least, I have had many with you, and enjoyments shared by you were by far the brightest flowers that ‘ere bloomed in my Eden of memory. I would like so much to be at home these beautiful spring day, and can imagine how delightful they are there. Everything there in full bloom and fresh, now summer is fast verging on the track of spring. How delightful to sit on the flowery banks of the “big branch” and entice the juveniles of the finny tribe to take a nibble! Wouldn’t I resolve myself into a committee of the hole on the state of the fish, and resolve unanimously that the latter be “chawed”? Wouldn’t I those? How the editorial we of this epistle would take pleasure in dropping them a few lines! Did you not have a May Party? or some kind of a picnic on the 1st May? nor a fishing Party? Couldn’t “skeer up” a Genus Homo, species unconscriptus about there? Well I think that is too bad, and it’s all attributable to these old Yankees: I almost wish that we had killed the last on of them in this last fight, the rascals. By the bye, I liked have forgotten to tell you about the fight – the “little twist” we have had for the last few days. Our Regt was the first to give them a reception and a hearty one it was too. They commended putting in their pontoons just opposite where our Regt was on picket, some four miles below Fredericksburg, on the morning of the 29th Apr just before day, and our boys turned loose on them with such sudden effect, that it threw them into confusion. Col Smith and many others say that they never heard such a rumpus. The waggoners hallooing to their teams, rattling of planks, splashing of boats as they threw them in the water hurried commands of officers trying to rally their men, cries of the wounded and shouts of our boys rose in a continued din through the misty darkness. They could not withstand such firing until they received reinforcements. The fight was hot until our ammunitions gave out, and the Yanks had driven back a N.C. Regt in our right and tried to cut us off. Our Regt then fell back to the railroad near Hamilton’s crossing. One corps of Yanks crossed at Fredricksburg and just below, and our division only was left here to hold them back. The main bodies of the two armies met some twenty miles above here at Chancellorsville and had a bloody fight there on Saturday and Sunday. It is said to have been the bloodiest battle of the war; their dead lay in heaps in their entrenchments and were scattered for five miles where our men had charged them. They wouldn’t stand at all except those that engaged A. P. Hill’s Div, who stood for about two hours. They skedaddled like rabbits, and our Brigade with the exception of the skirmishers did not get a shot at them. Our Brigade charged and retook Marie’s heights, captured many horses, wagons, cannon, & prisoners and drove the Yanks across the river at Fredericksburg. 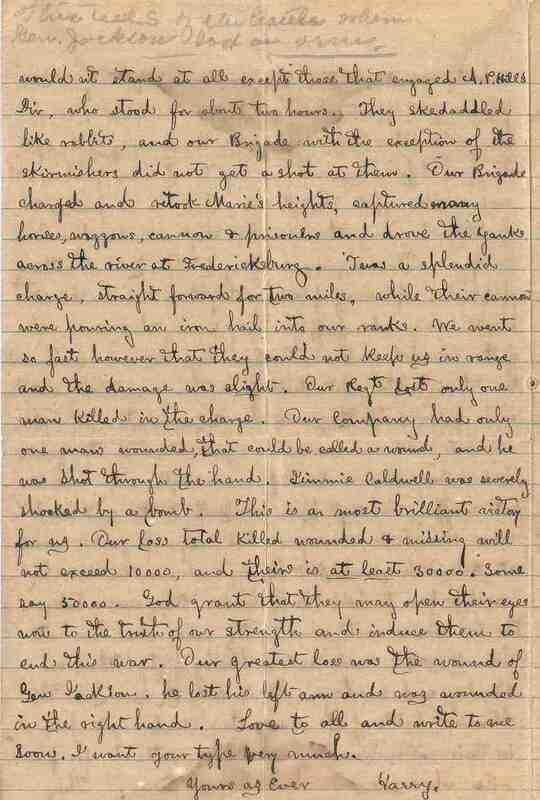 ‘Twas a splendid charge, straight forward for two miles, while their cannon were pouring an iron hail into our ranks. We went so fast however that they could not keep us in range and the damage was slight. Our regt lost only one man killed in the charge. Our company had only one man wounded, that could be called a wound, as he was shot through the hand. Jimmie Caldwell was severely shocked by a bomb. This is a most brilliant victory for us. Out loss total killed wounded & missing will not exceed 10000, and theirs is at least 30000. Some say 50000. God grant that they may open their eyes now to the truth of our strength and induce them to end this war. Our greatest loss was the wound of Gen Jackson. He lost his left arm and was wounded in the right hand. Love to all and write to me soon. I want your type very much. More about this item: General Jackson died the day after this letter was written, having contracted pneumonia after being wounded in battle. 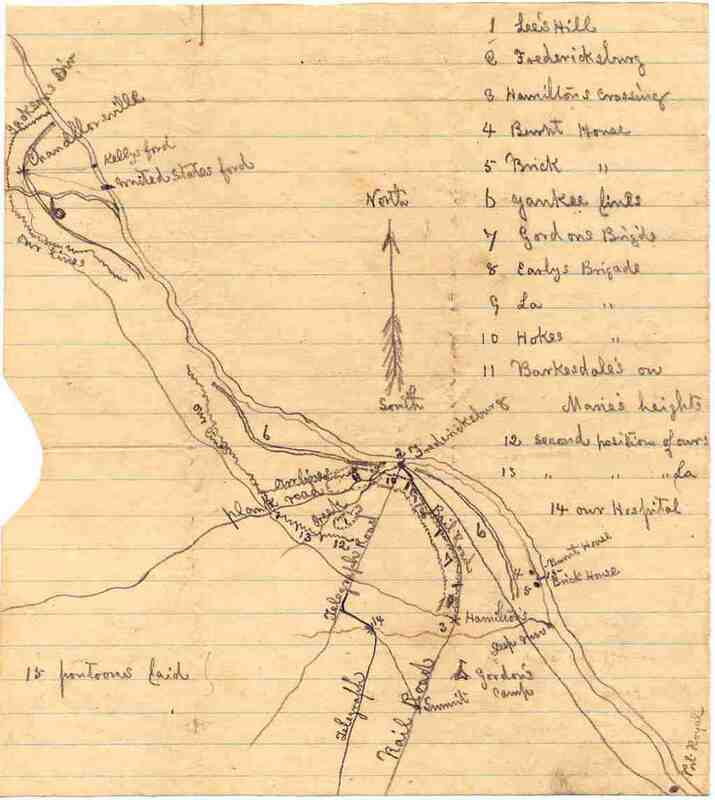 Also included in the Harrison Wells Papers are the following map of the Battle of Chancellorsville and images of Harrison and Mollie. After the war, the couple married and resided in Zebulon, Georgia. Undated map of the Battle of Chancellorsville from folder 2 of the Harrison Wells Papers, Southern Historical Collection, Wilson Library, University of North Carolina at Chapel Hill. 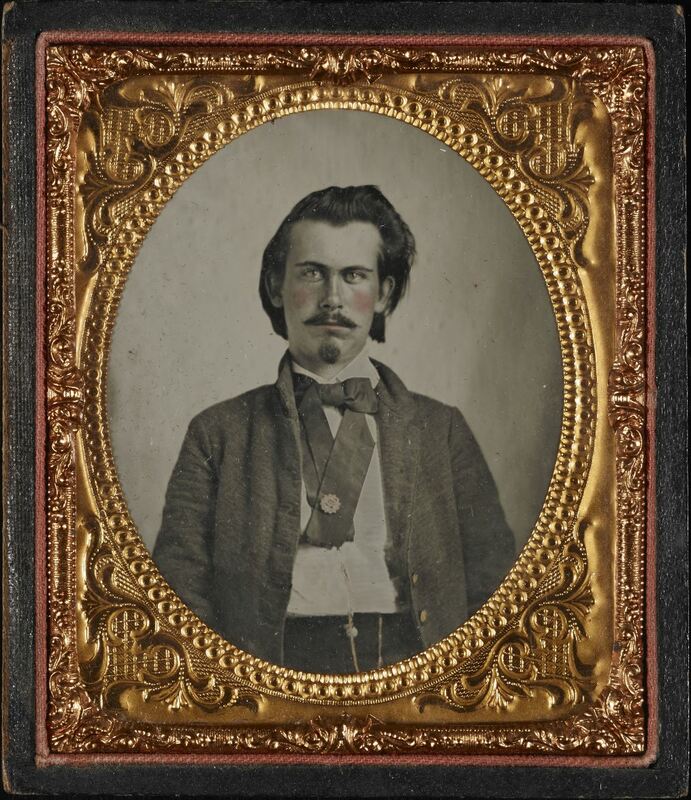 Ambrotype of Harrison Wells, circa 1860, from the Harrison Wells Papers, Southern Historical Collection, Wilson Library, University of North Carolina at Chapel Hill. 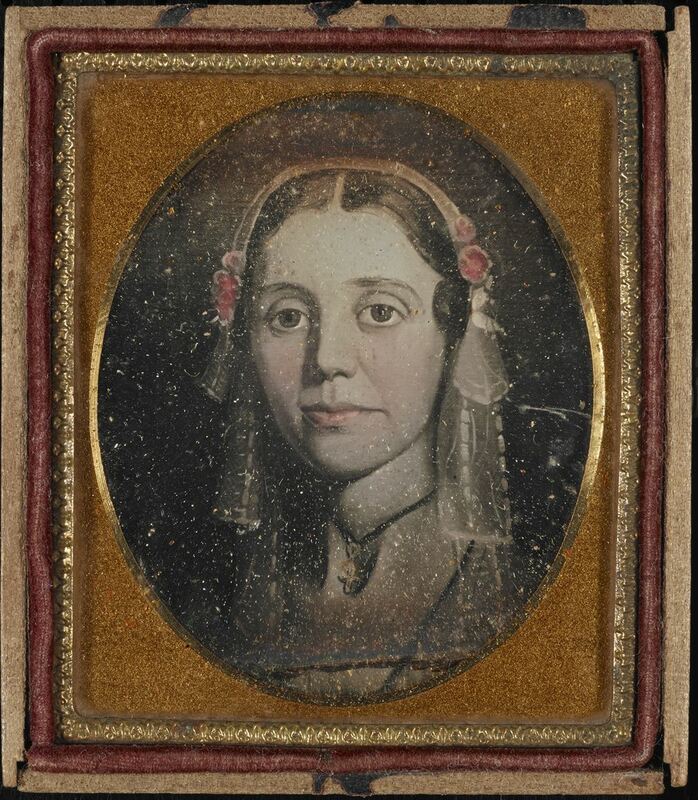 Daguerreotype of May “Mollie” Long, circa 1860-1865, from the Harrison Wells Papers, Southern Historical Collection, Wilson Library, University of North Carolina at Chapel Hill. This entry was posted in Southern Historical Collection and tagged 13th Georgia Infantry Regiment, Battle of Chancellorsville, courtship, Gen. Stonewall Jackson, Harrison Wells. Bookmark the permalink. Another great in the moment -or as close as one can get 150 years later- post!